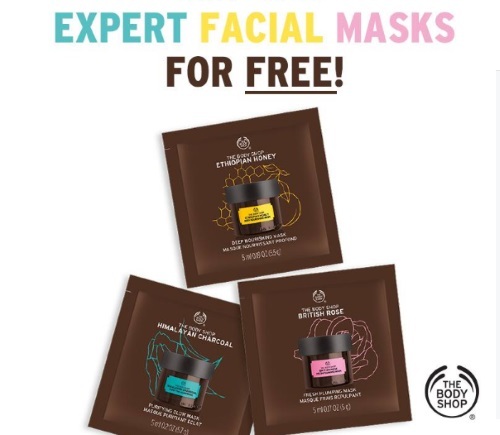 The Body Shop has launched new Expert Facial Masks! You can receive 3 Free Samples and send samplers packs to your friends too! Be one of the first to try the Expert Facial Masks from The Body Shop for Free! Claim one for yourself and send a sample to three friends! Coupons are only redeemable in store while supplies last! The sample pack includes the British Rose Plumping Mask, Ethiopian Honey Deep Nourishing Mask and Himalayan Charcoal Purifying Glow Mask. After you enter your email at the link below, you will be provided a coupon to redeem at The Body Shop retail stores only. Show your mobile or printed coupon in-store and redeem your free sample. Offer valid until October 17, 2016 or while supplies last. Offer not valid online. Click here to get your Free Facial Masks.